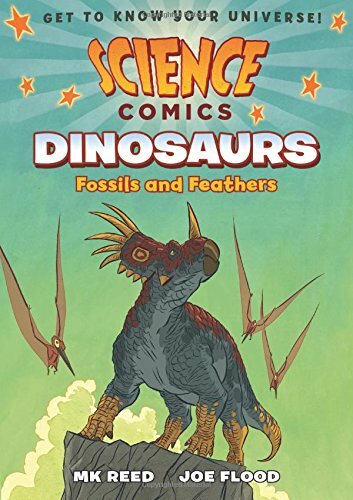 Summary: Focusing mostly on humans’ gradual discoveries of the history of dinosaurs, this graphic science book covers paleontology from the Industrial Revolution to the present. In 1800, the reader learns, it was believed that the Earth was 6,000 years old, that dinosaurs had vanished a few thousand years before in Noah’s flood, and that there were no examples of dinosaurs left. The author updates these beliefs as she moves through history until 2000 when scientists believe the earth is 4.5 billion years old, dinosaurs lived over 25 million years ago, and descendants of dinosaurs are living today. It’s a fascinating journey, with heroes and villains making discoveries, disputing the claims of their peers, and inching their way toward a better understanding of Earth’s history. Back matter includes a glossary, a timeline of geologic eras, and a short list of further reading. Part of a new “Science Comics” series that includes (or will soon include) books on coral reefs, volcanoes, bats, flying machines, and the solar system. 128 pages; grades 4-7. 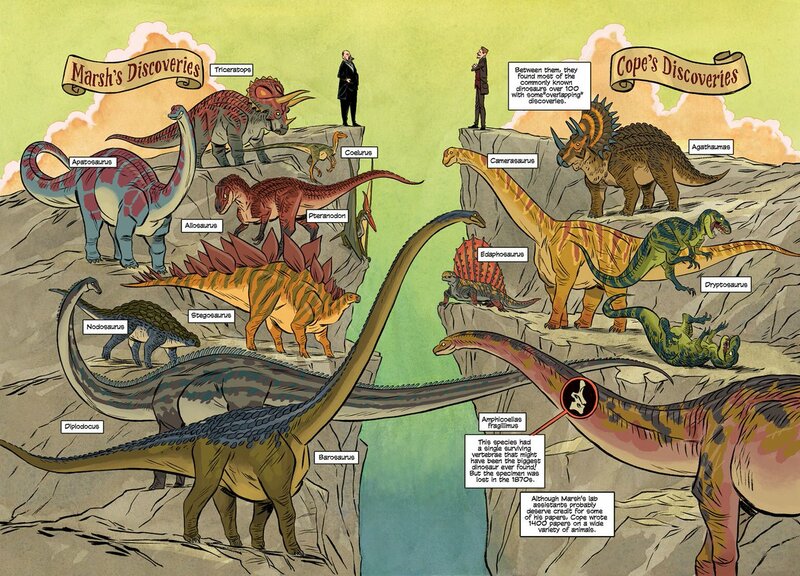 Pros: A fascinating history of paleontology with some really spectacular graphics that do a great job of visually depicting concepts like dinosaur sizes and family trees. Cons: The list of books for further reading was pretty short, and the titles were several years old.